Outrageous glow-in-the-dark American mythology weirdness, with engaging turns by all three leads and supporting names too. Shadow Moon (Whittle) gets out of prison early after his wife Claire (Browning) is killed in a car crash. On the way home, he is befriended by a mysterious stranger, Mr Wednesday (McShane). Mr Wednesday offers Shadow Moon a job as his bodyguard and enforcer; soon the unlikely duo are involved in a strange and rather bloody road trip across America. This is the first season in a projected four-season storyline that’s based on a late 1990s’ novel by Neil Gaiman. It takes both materialist and idealist approaches to its storyline: an approaching war to end all wars between the old-world gods that generations of immigrants have brought to the shores of USA; and the ‘new gods’ of technologized capital. The approach is ‘materialist’ in that the gods are incarnated in actors; but, as Mr Wednesday keeps on saying, the gods only exist because real people believe in them. Whittle and McShane use their eyebrows a lot in their acting (wrinkled, arched respectively) but their sparring banter is all good humoured and they both have craggy faces that I find inherently interesting to watch. Emily Browning’s re-animated character Claire becomes a focus in the second half; and it’s surprisingly fun to watch her coping with her revenant status, even though that involves stitching her arm back on and noisily evacuating embalming fluid into a toilet bowl. There are nice supporting turns by Gillian Anderson (as Marilyn Monroe and Lucille Ball from I Love Lucy! ), Peter Stormare, Crispin Glover and Cloris Leachman. Increasing the weirdness are Pablo Schreiber (from Season 2 of The Wire – unrecognisable!) playing Shadow Moon’s nemesis, Mad Sweeney the leprechaun. And Yetide Badaki playing an Egyptian goddess with an unusual but all-enveloping approach to communing with her followers. Visually, American Gods is a treat too, glowing with synthetic neon-ised colours that seem appropriate given that this is an exploration of the mythologies that keep USA in overdrive. There’s a highly charged ‘lynching in the rain’ scene early on that pulls out alI the stops, visually speaking. I wonder how scenes like this will look to audiences in 20 years’ time? For now, they seem impressive in their technological saturation. 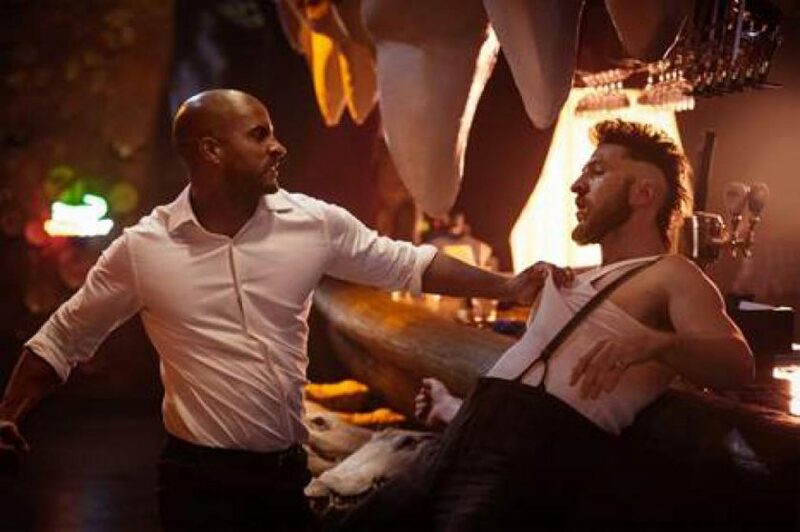 Of course, as with most tv series, American Gods lingers too long over some of its dramatic elements and restates its liberal ‘comparative religion’ message too often to stay fresh. But it gets 10 out of 10 for imagination, execution and acting. American Gods is available on Blu-ray, DVD and digital download on 31 July 2017.